When designing a butterfly garden, it is important to give the butterflies several things to make the habitat attractive to them, and to fulfill their life cycle needs. Most butterfly gardening books focus on nectar plants, which will attract transient butterflies looking for something to eat. To encourage butterflies to remain and even colonize your garden, you must also plant larval or host plants for the caterpillars to eat. Ideally you will also have a shallow mud puddle (to provide water, minerals & salts), and a flat, light-colored rock for the butterflies to bask on in the sunlight. Keep grass mowed as high as possible, to provide habitat for Blues and Skippers. Create your butterfly garden design in a manner similar to the picture shown below, to give them a windbreak, and provide a variety of food sources, both nectar and larval, for the different types of native butterflies you are trying to attract. If planting a large area, you could place your taller plants in the center, planting in decreasing heights in a circle around the tall plants. This way you can plant several types of plants with different sun/shade requirements, and then observe the butterflies to see which they prefer to help plan your plant choices in future years. It is better to plant with flower colors in groupings of similar hues, rather than mixing the colors indiscriminately, as this has been observed to be a preferred attractant for butterflies. Remember that you absolutely, positively CANNOT USE INSECTICIDES in your butterfly garden, or you will kill the butterflies and caterpillars!! Use natural biological pest controls only. The following list includes a variety of nectar plants that will attract butterflies. When creating a butterfly garden, the size of the flower is important as to whether a species of butterfly can nectar on it. Larger, trumpet shaped flowers are used by larger butterflies (which have a longer proboscis), while smaller butterflies require shorter tubed flowers on which to nectar. Try not to purchase nectar plants that have been heavily hybridized to create double flowers, as these are generally poor nectar producers. In descending order of color preference, butterflies seem to prefer flowers that are red, yellow, orange, purple, pink, blue or white. Below are some common North American butterfly species and their preferred larval or host plants. 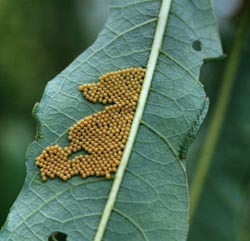 Some larval plants are also nectar plants. Be aware that virtually any plant purchased from a commercial nursery has been thoroughly doused with insecticides, and may also have systemic pesticides in its soil. You should repot all non-organically grown plants in fresh soil, and rinse leaves and flowers repeatedly for at least a week before introducing them to your butterfly garden. Learn how to design a garden that encourages butterflies to visit and reproduce. With appropriate plants and an insect-friendly environment, you can attract these beautiful creatures to any size garden, regardless of your climate or urban setting. Classes are taught by many Garden Clubs, Museums, etc.